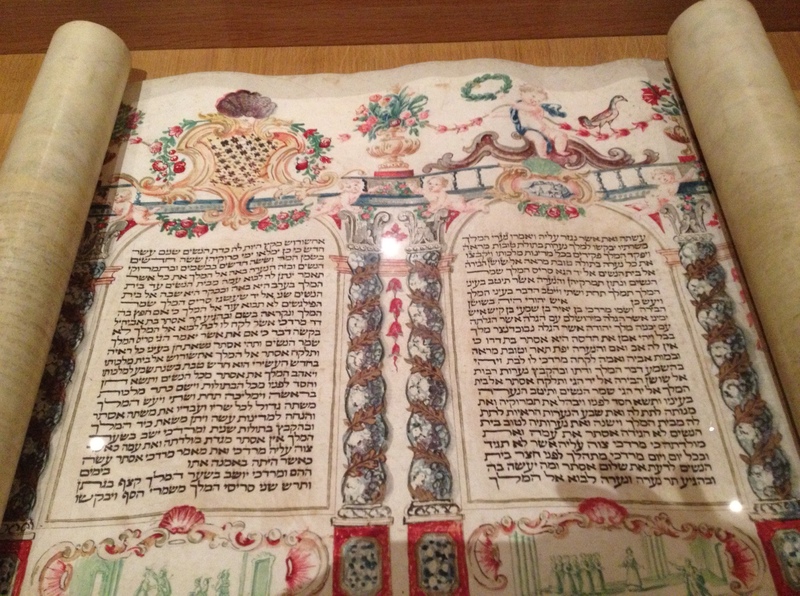 Our first stop was the Jewish Museum where I surreptitiously took photos with my iPhone even though it was clearly forbidden. The security guard was not happy with me. So much for being surreptitious. 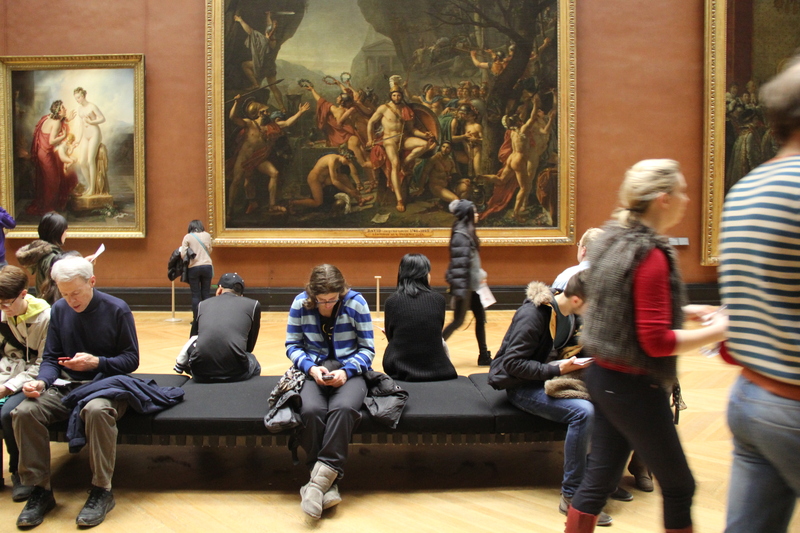 But seriously – what’s the point of going to a museum if you can’t take pictures of all the really old stuff? The scary man is a statue of Alfred Dreyfus from the infamous Dreyfus Affair. 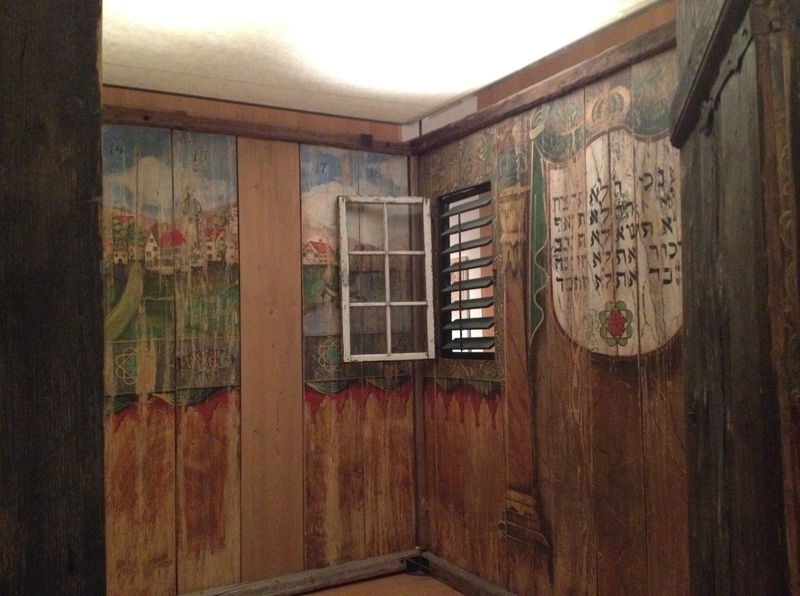 A really old sukkah at the Jewish Museum – if you know what that is, it’s kind of cool. If you don’t, just take my word for it. We made our way through the mess of narrow pathways, considering our dinner options and admiring the history. 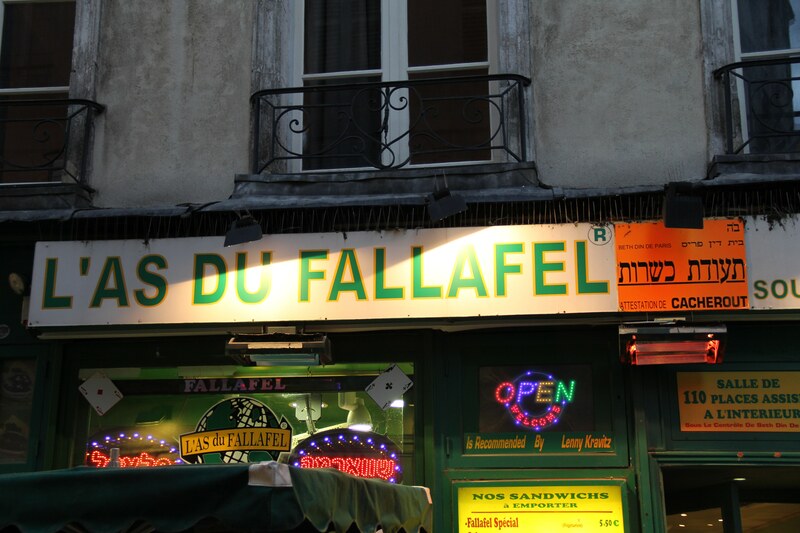 Because we couldn’t possibly pass up “the best falafel in the world,” we settled on L’as Du Fallafel and picked up a bunch of pastries and snacks for later at some of the most amazing smelling bakeries I have encountered in my life. I love these narrow, windy streets. 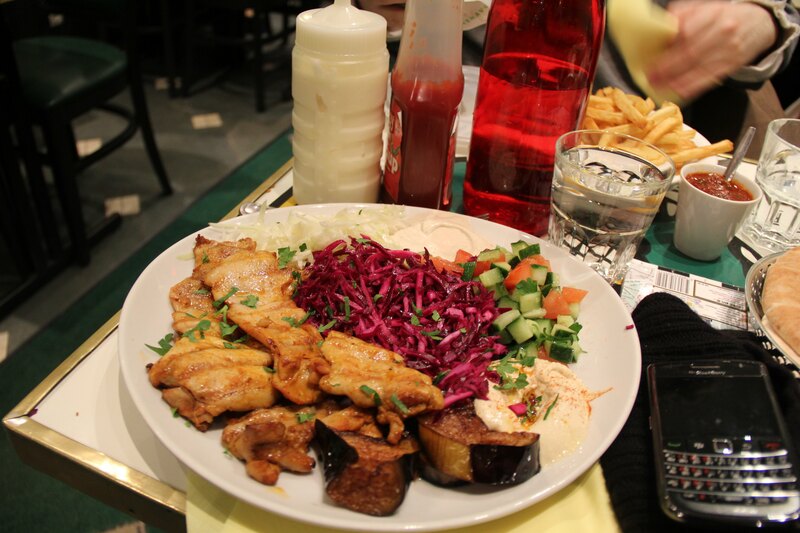 Wait…I thought the other place had the best falafel in the world? This Art Nouveau synagogue was designed in 1913 by Hector Guimard, the same dude who designed Paris’ famous metro entrances. I do love me some hummus. Finally, we wound our way to the Pompidou Centre. Some people think the inside-out architecture is an eyesore on Paris’ aristocratic skyline, but I think it’s awesome. Even though it was already 7 p.m., the lines were at least 20-30 minutes long. We managed to find a back entrance through the library without a line at all, so if you have the Pompidou Centre on your bucket list, take note. In addition to the art exhibits, Pompidou has great views of the city from its top floor and a funky modern restaurant and bar area. 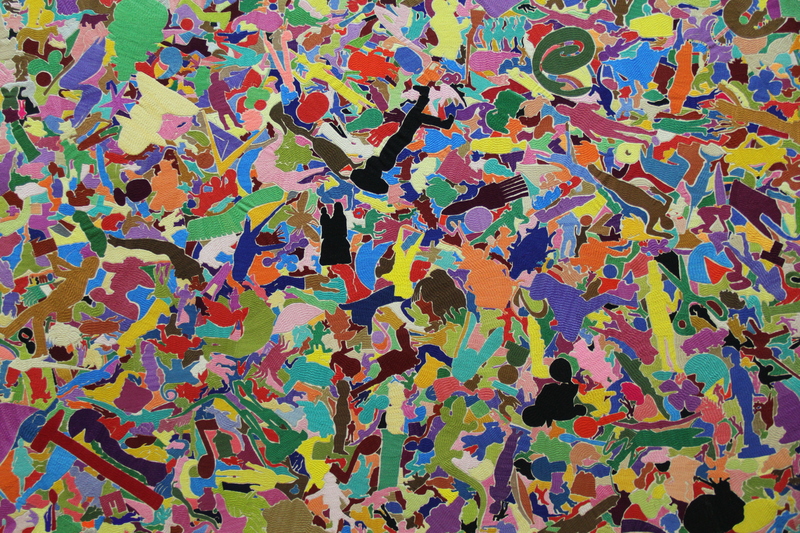 If you’re not congenitally allergic to modern art and/or falafel, I recommend a visit to Pompidou and Marais. 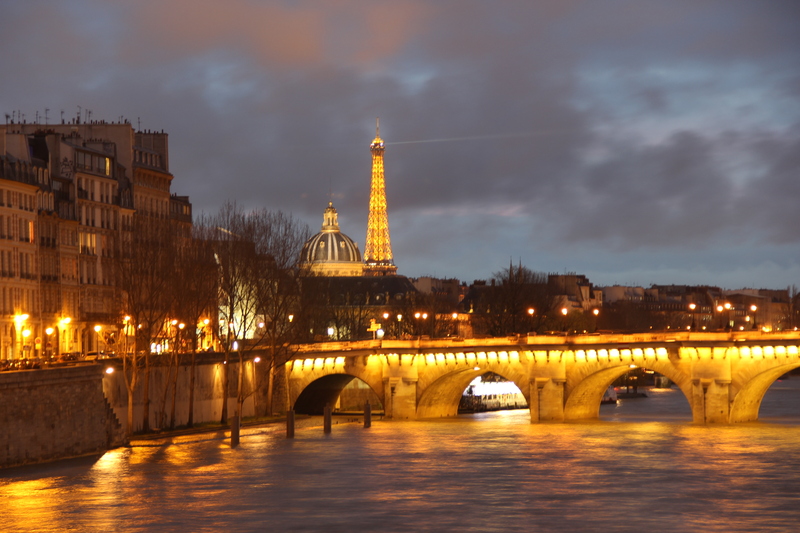 There’s a reason Paris is called the City of Lights. At night the city is lit up galore. 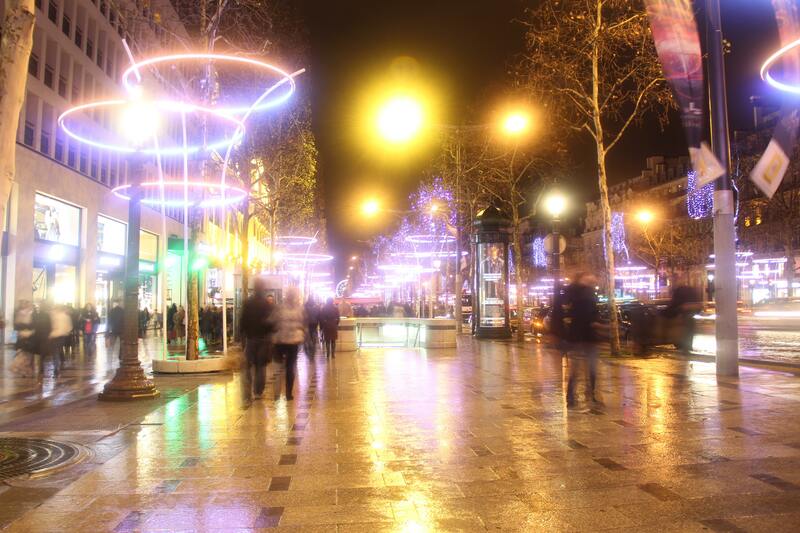 For an amateur photographer like myself, the bright lights and flashing colors are a temptation I couldn’t resist. This was unfortunate for The Boyfriend because he has to wait while I set up my travel tripod and play around with the shutter speed. So for the record, let me reiterate: The Boyfriend is amazing. The Louve again. 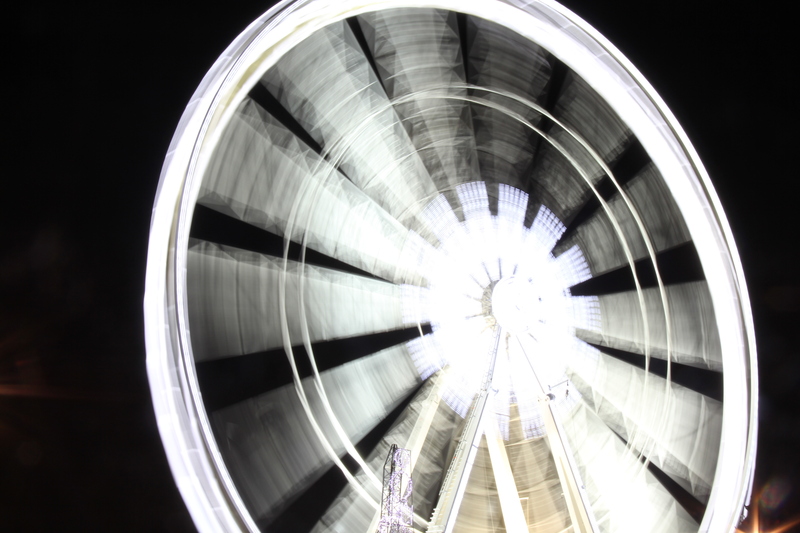 I had a blast doing these shots until my tripod broke. Sad. 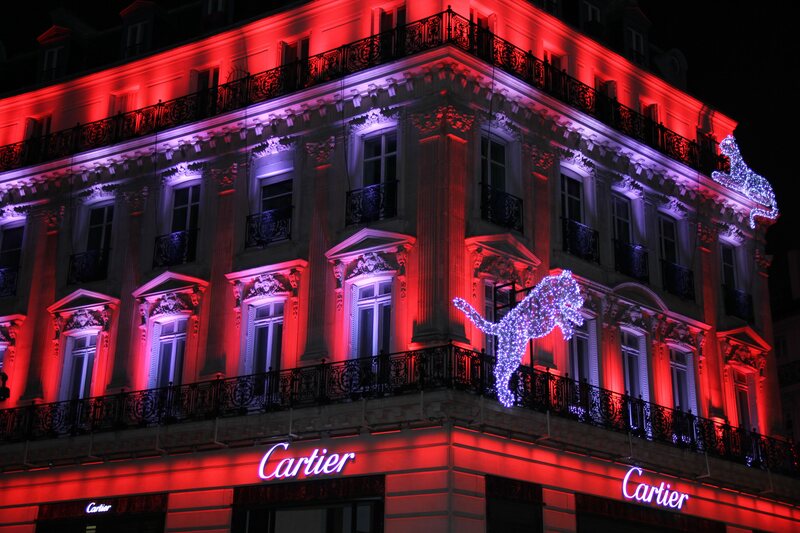 Champs Elysees at night. I had to balance my tripod on a garbage can to shoot this. 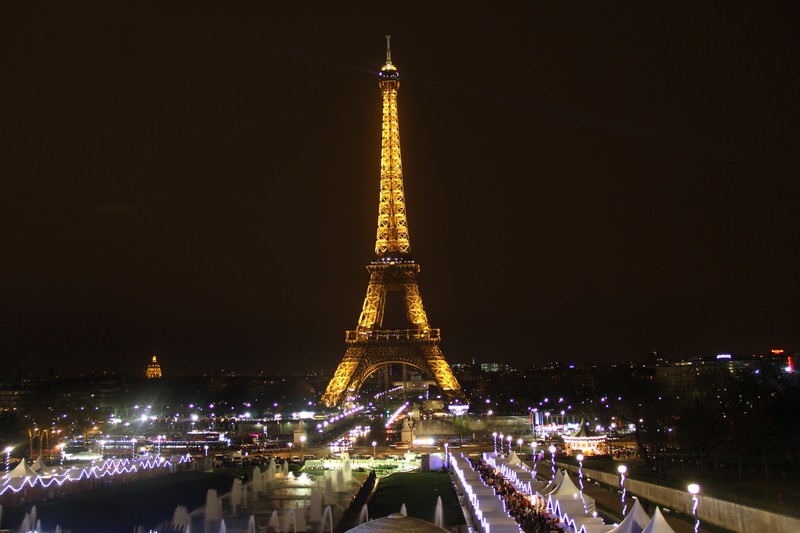 The Eiffel Tower is one of the most famous buildings in the world. Even the cynic in me was impressed. 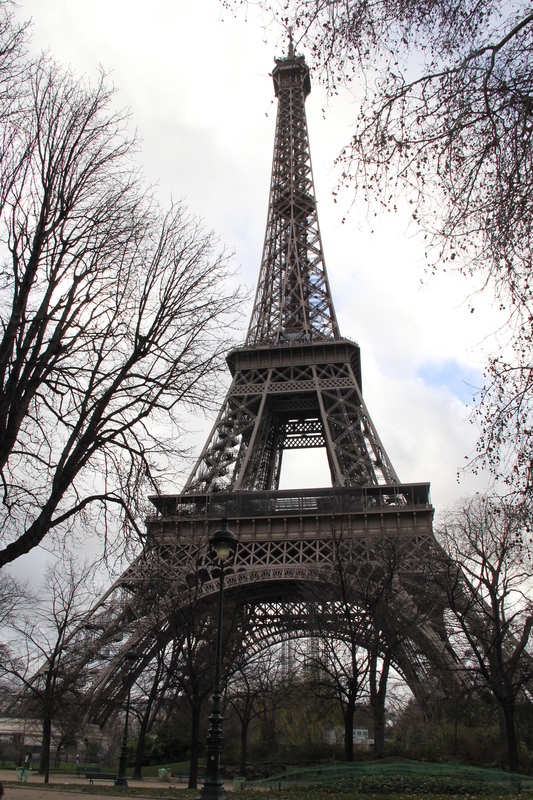 Sure, we have taller buildings and structures in the U.S., but it is the tallest structure in Paris and the most visited paid monument in the world. 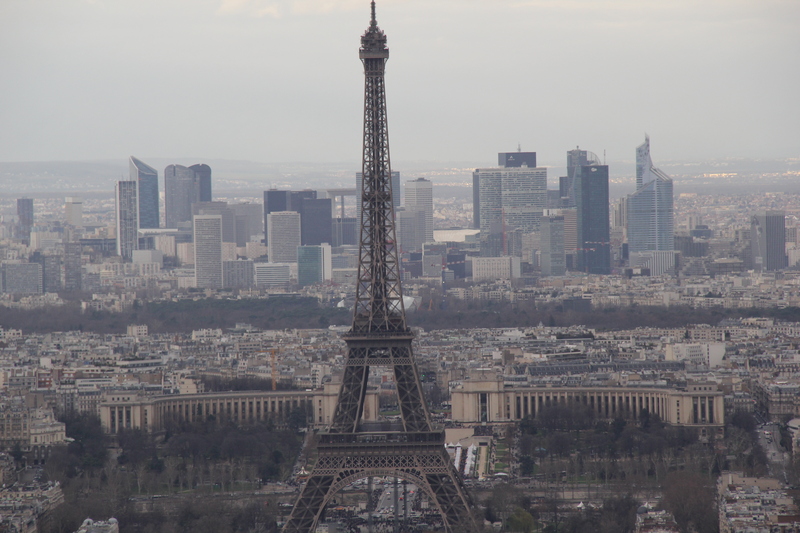 Standing proud at 1,050 feet, the tower dominates the Paris skyline. It is all the more impressive when you consider that the Eiffel Tower was erected in 1889 as the entrance arch to the 1889 World’s Fair. In 1889, the tallest buildings in the U.S. were just over 300 feet. 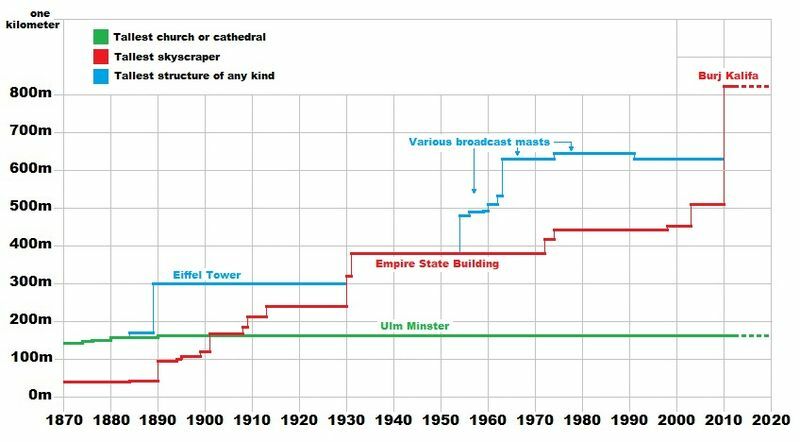 Neat chart that demonstrates just how awesome the Eiffel Tower was for its time. 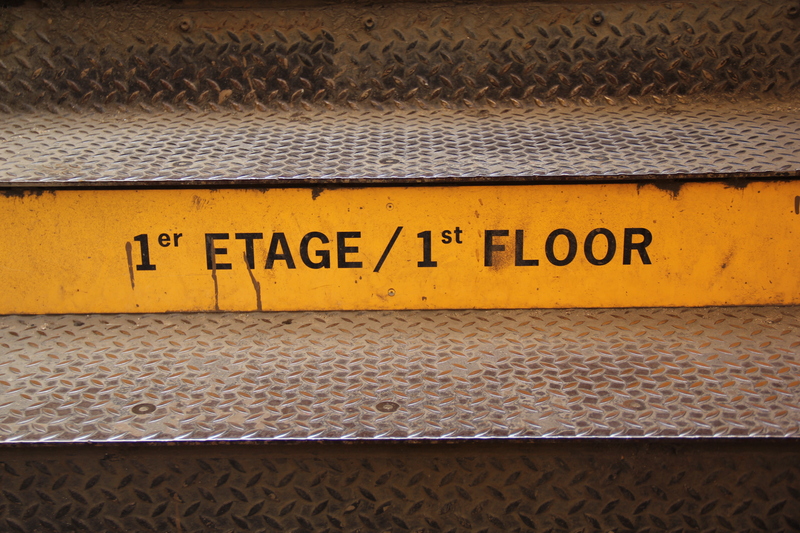 We opted to walk up to the first and second level to skip the long lines for the elevator. This proved to be a smart move at the time, but less smart the next morning when I could barely move my legs. Sadly, by the time we got to the second floor the very top level was closed due to excessive winds. 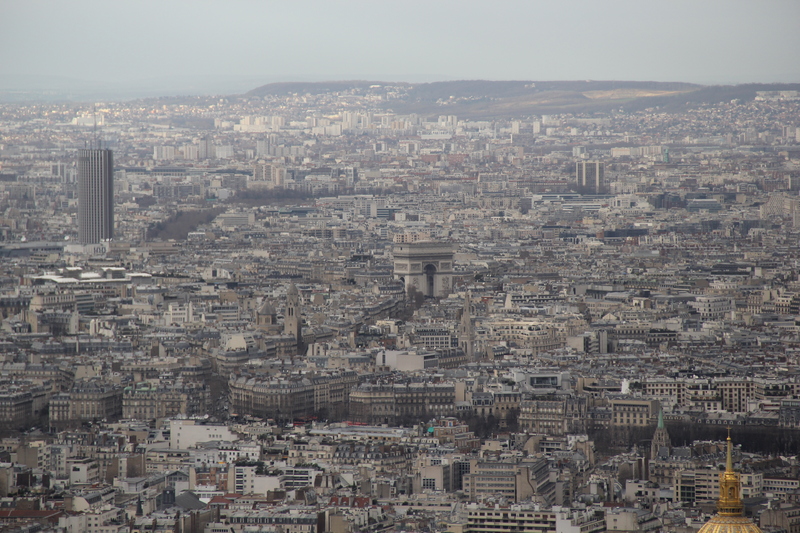 I’ll spare you the 200-plus photos I took of the views since they are pretty similar to the pictures I took from the Montparnasse Tower. But here are some others. 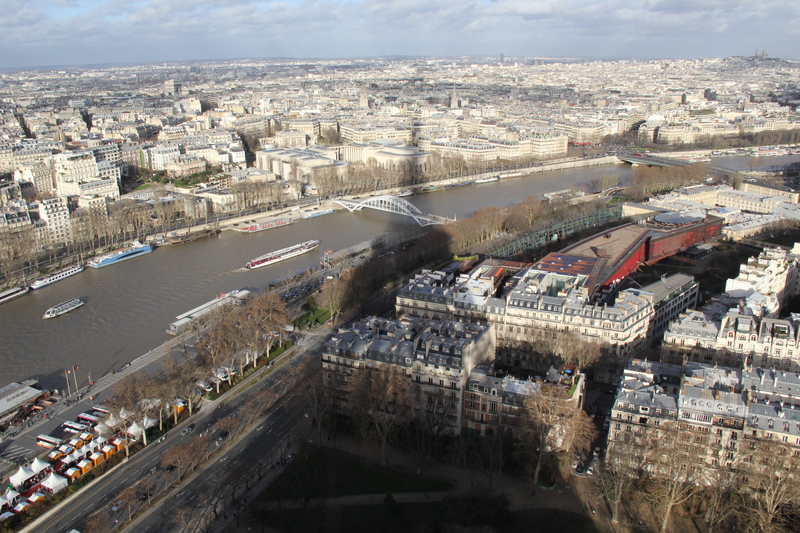 I love this shot of the Eiffel Tower casting its long shadow over the city. 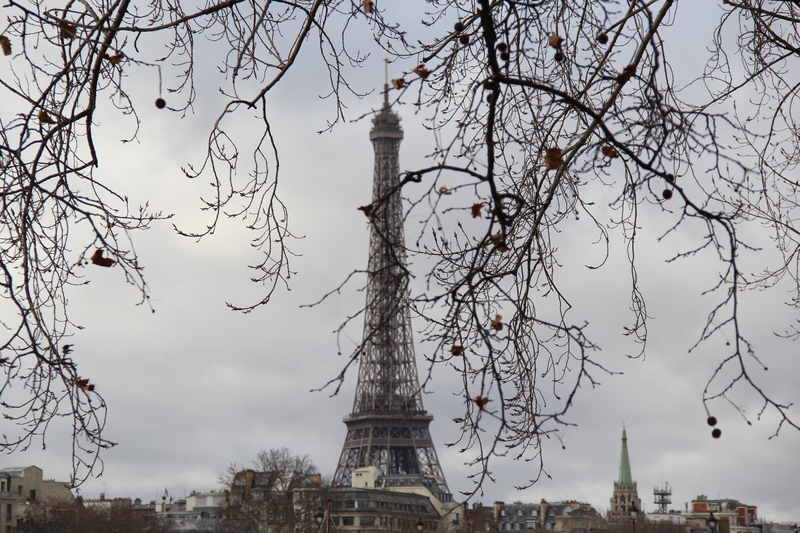 The Eiffel Tower in the distance as we walked toward it. The slow climb up… And here, I thought I was in shape. 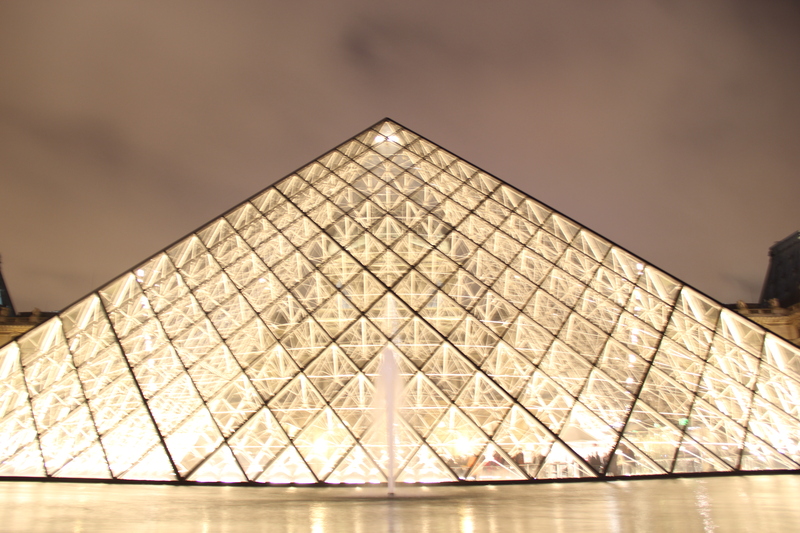 Yes, the Louve is a stunning complex of buildings. It is massive and some of the building are pieces of art themselves. 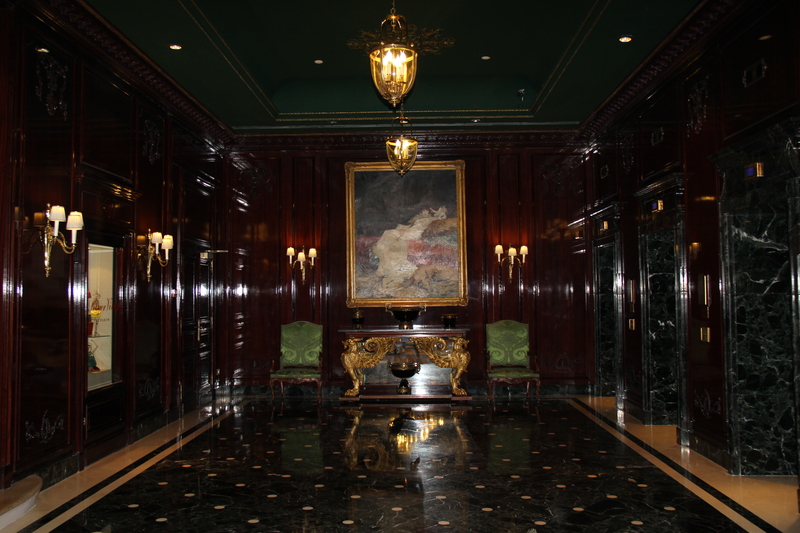 But I know something’s wrong when I’m more awed by the painted ceilings than the actual paintings hanging on the wall. Let me just come out and say it: I am not a huge fan of medieval art. Give me a bunch of Jackson Pollack sguiggly lines and I’m all “wow – that’s incredible,” but picture after picture of baby Jesus and I’m struggling to feign interest. Pretty much anything pre-Impressionism bores the heck out of me. But this is the Louve we’re talking about. We had to go to the Louve. 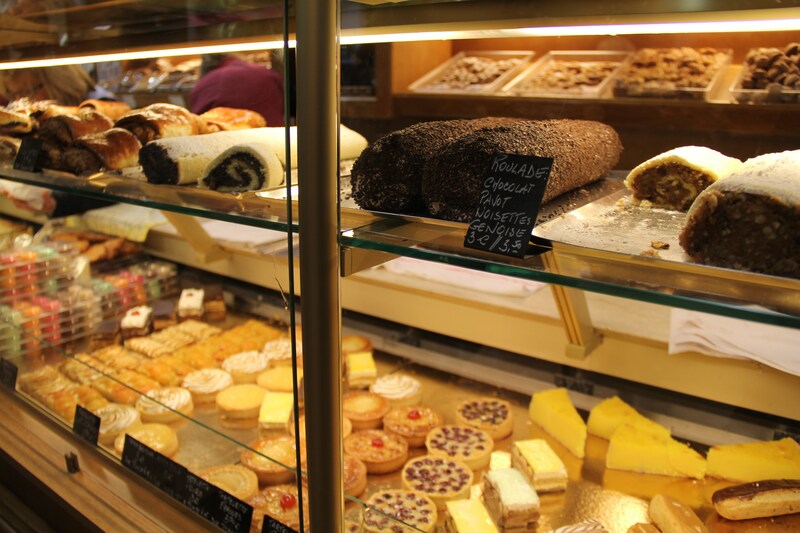 We finally made it to Paris — how could we not go? So we went. These two photos pretty much sum up my experience. It’s the Mona Lisa!!! All I have to do is squeeze past this throng of people. There, I made it and only lost one toe in the process. 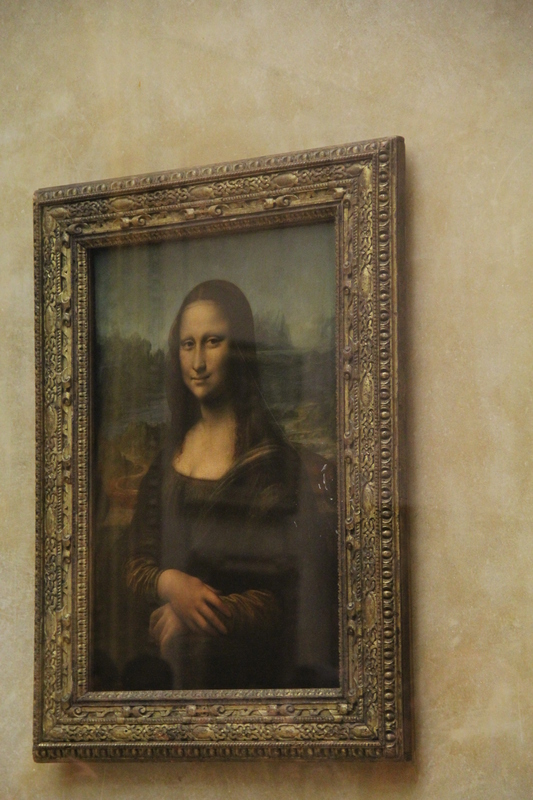 I’m actually looking at the Mona Lisa. Wow…it’s so small. Um, I don’t get it. Why is this painting such a big deal? Me at the Louve reading my blackberry. My feet hurt. 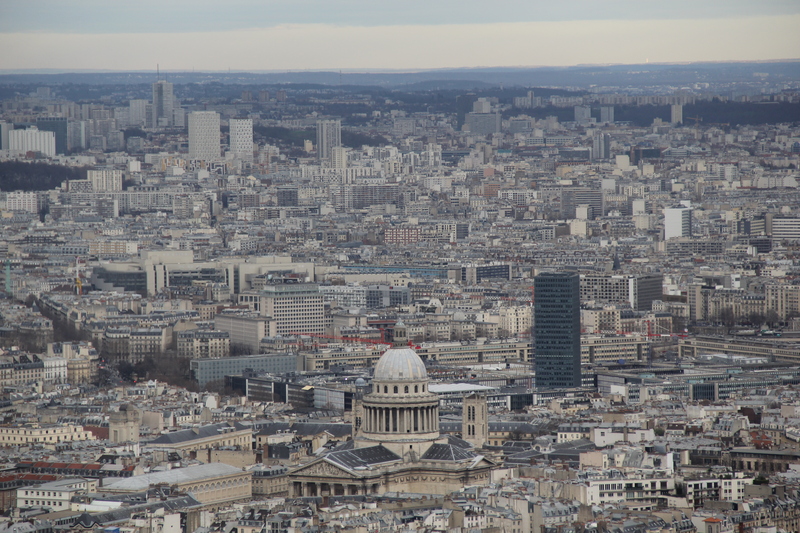 If you want to see all of Paris at once, there’s no greater place than from the top of Montparnasse Tower, Paris’ lone skyscraper, standing proud and alone at 689 feet. The 360 degree views are amazing, and you can truly test your geographic knowledge of the surrounding area. To help you out, I’ve put together a geographic guide for you. To orient yourself, Montparnasse Tower is signified by the pink pushpin on the map below. 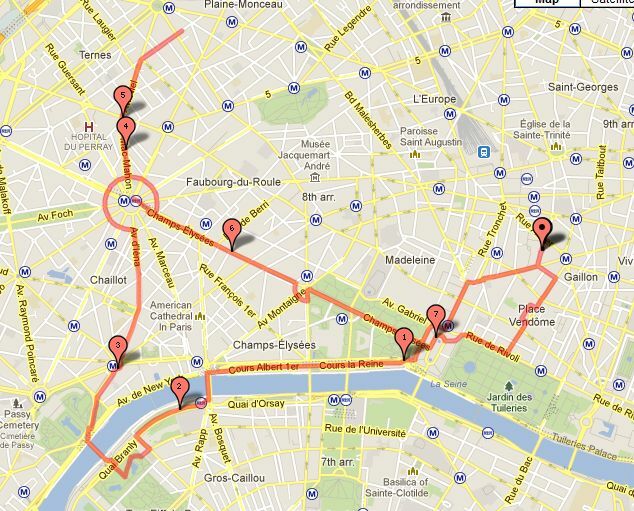 The other blue icons represent all the famous Paris sites I will tell you about. Are you excited? ARE YOU EXCITED??? You should be. There are so many items to point out in this photo. 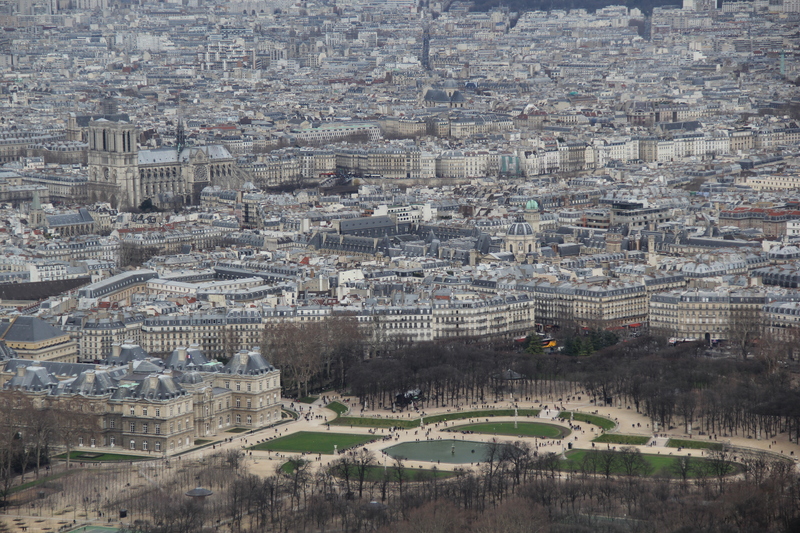 The long stretch of grassy park just south of the Eiffel Tower is called Parc du Champs de-Mars. 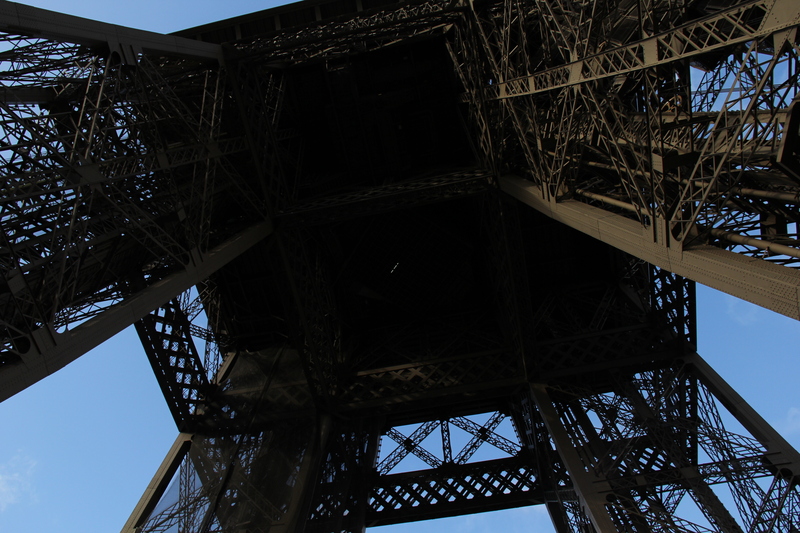 That tall structure is, of course, the Eiffel Tower, named after Gustave Eiffel, the engineer whose company designed and built the tower. The tower was built in 1889 as the entrance arch to the 1889 World’s Fair. The sky-scrapers in the background are located just outside Paris in an area call La Defense. 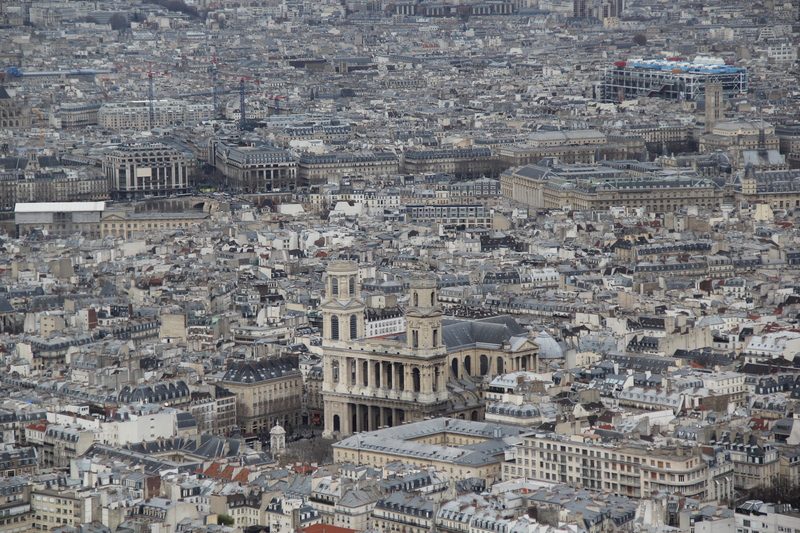 This is Paris’ main business district. 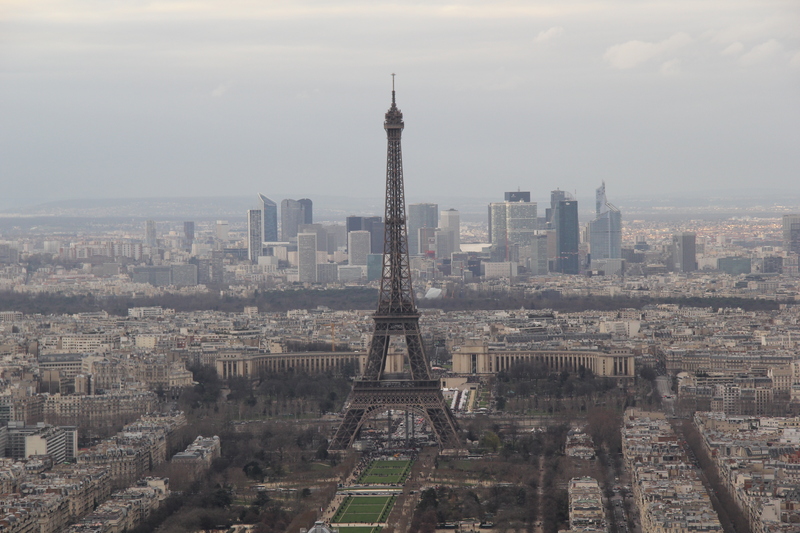 The two buildings forming a semi-circle around the Eiffel Tower form Place de Trocadero. The place was named in honor of the Battle of Trocadero, in which French forces captured Isla del Trocadero in southern Spain in 1823. The original Palais du Trocadero was built to host meetings and concerts for the 1878 World’s Fair. In 1937, the old building was destroyed and replaced by today’s Palais de Chaillot which now sits atop Trocadero and houses a number of museums. 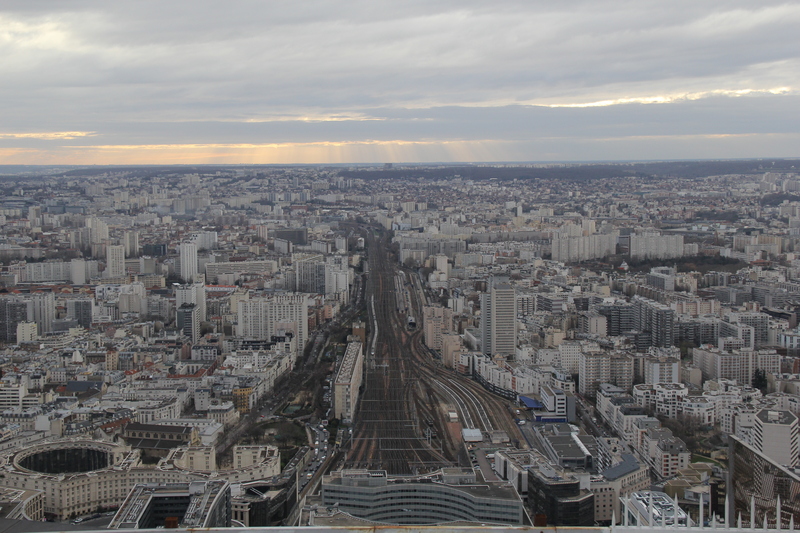 It’s a little hard to see, but right in the center of this photo, you’ll find the Arc de Triomphe. The Arc de Triomphe stands in the center of the Place Charles de Gaulle at the western end of the Champs-Élysées. The Arc was commissioned in 1806 after the victory at Austerlitz by Emperor Napoleon, but wasn’t finished until the 1830s. Today, it honors those who fought and died for France in the French Revolutionary and the Napoleonic Wars, with the names of all French victories and generals inscribed on its inner and outer surfaces. The monument stands 164 feet in height, 148 feet wide and 72 feet deep. It was the largest triumphal arch in existence until the construction of the Arch of Triumph in Pyongyang in 1982. 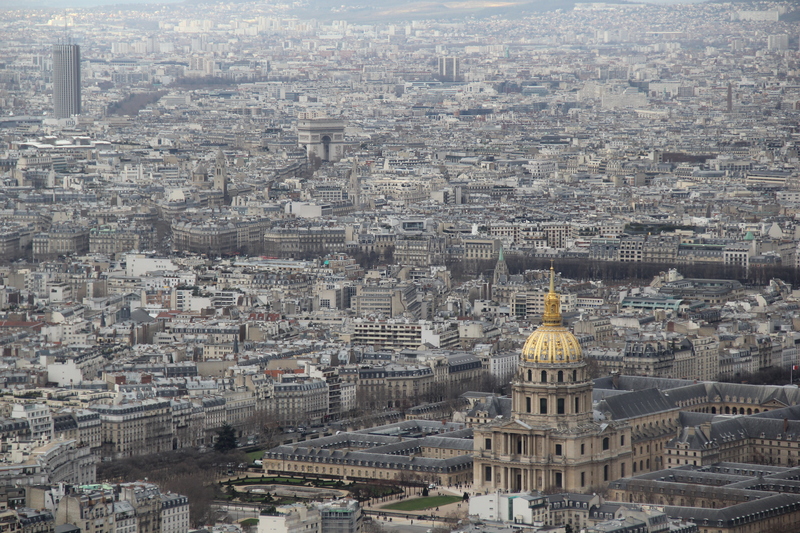 The gold-topped building is officially known as L’Hôtel national des Invalides (The National Residence of the Invalids). 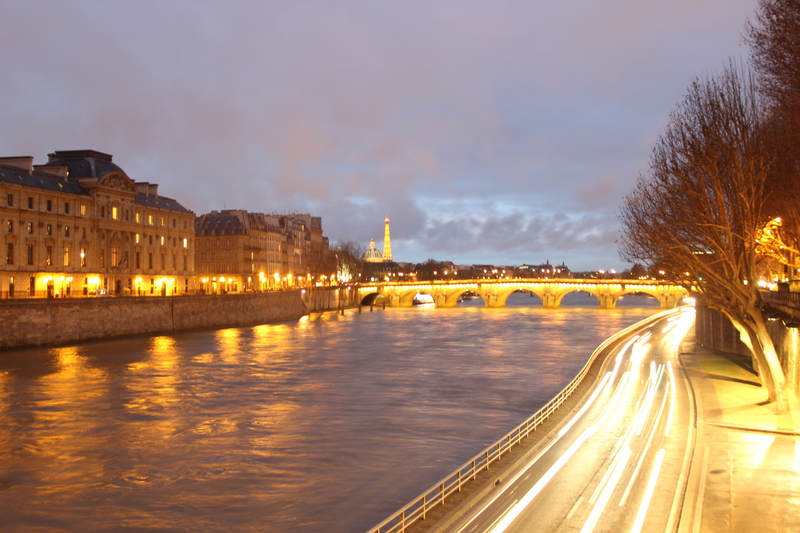 It is a complex of buildings in the 7th arrondissement of Paris containing museums and monuments. 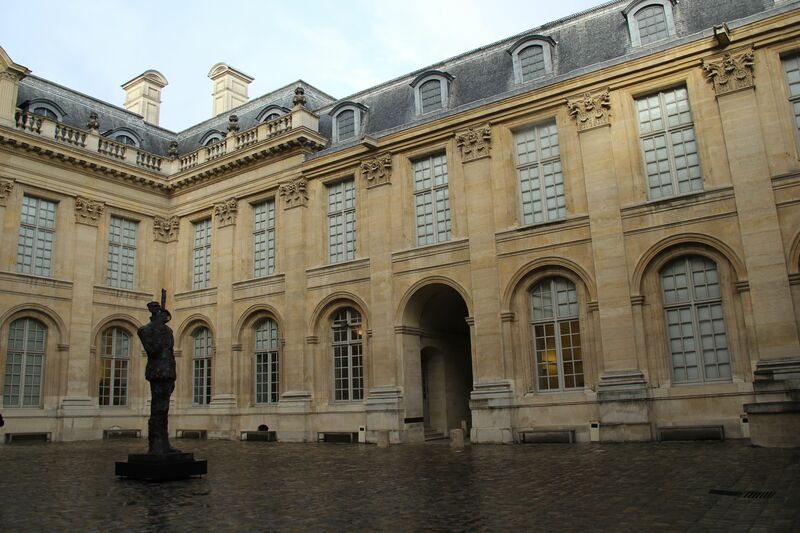 The buildings house the military museum of the Army of France , as well as the burial site for some famous Frenchmen, including Napoleon Bonaparte. 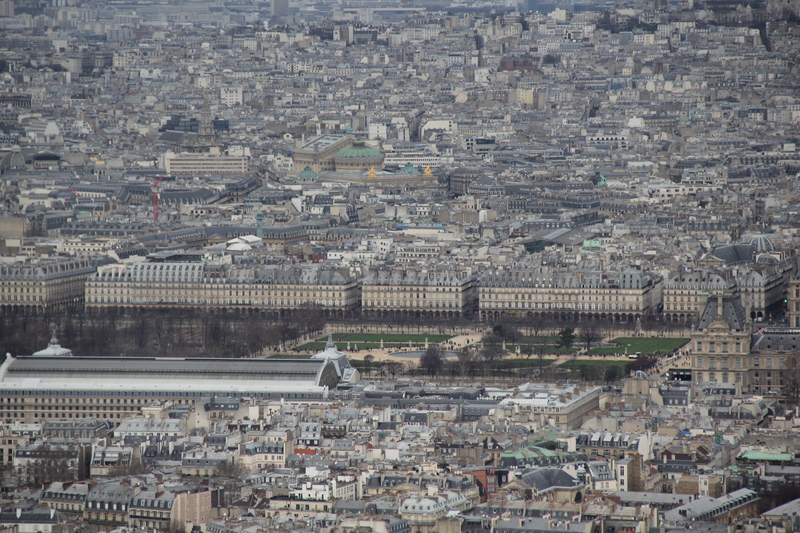 The large building with the glass dome ceiling at the bottom of the picture is the Grand Palais (Great Palace), a large exhibition hall and museum complex located at the start of Champs-Élysées in the center of Paris. The structure was built for the Universal Exhibition in 1900 and dedicated to the glory of industry. The large building just south of the long stretch of garden is the Musée d’Orsay, an art museum housed in the former Gare d’Orsay, a railway station built between 1898 and 1900. 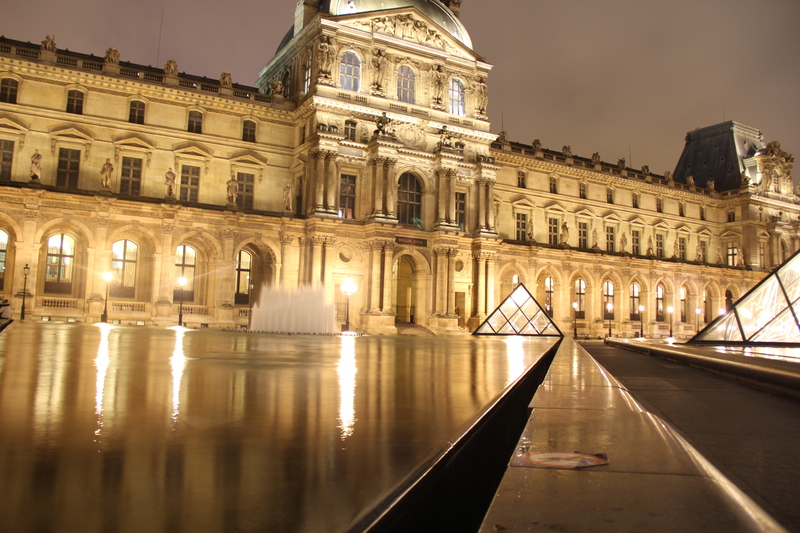 The museum holds mainly French art dating from 1848 to 1915, and is best known for its extensive collection of impressionist and post-impressionist masterpieces, including Monet, Manet, Degas, Renoir, Cézanne, Seurat, Sisley, Gauguin and Van Gogh. The museum opened in 1986. The ferris wheel sits in the center of a large public square at the start of Paris’ most famous street, Champs Elysees. 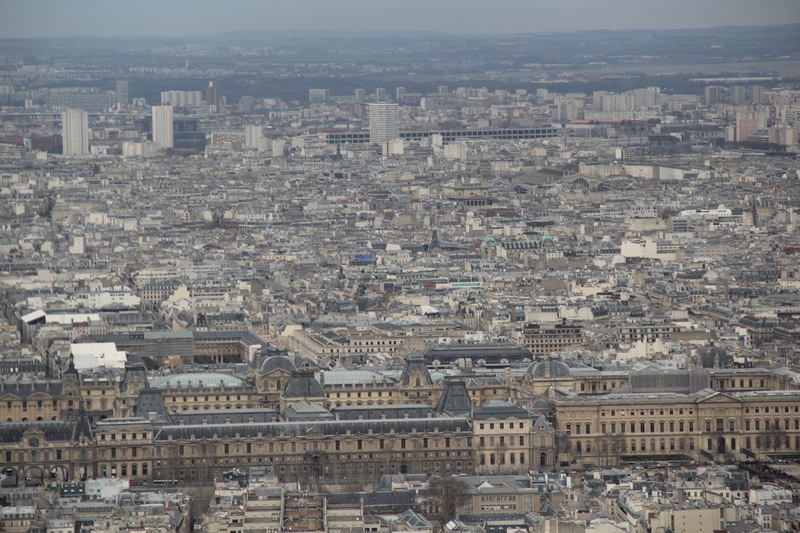 You can pick out the famous Louve by the long and vast array of buildings occupying the bottom of this photo. The Louve was built by Philippe Auguste to protect Paris from the Anglo-Norman threat in the late 12th century. Over time, the original fortress was expanded and transformed into a royal residence for various French kings. 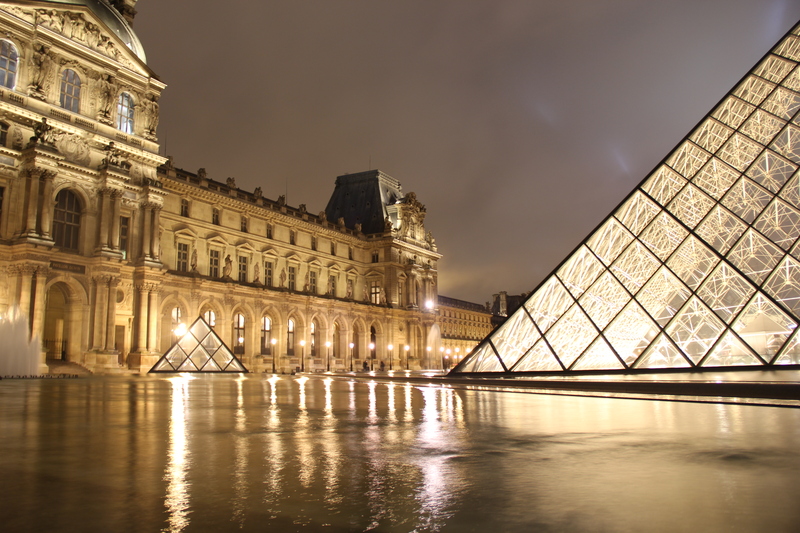 In 1791, the revolutionary Assemblée Nationale decreed that the Louvre would be a national palace to house the king and for gathering together all the monuments of the sciences and the arts. 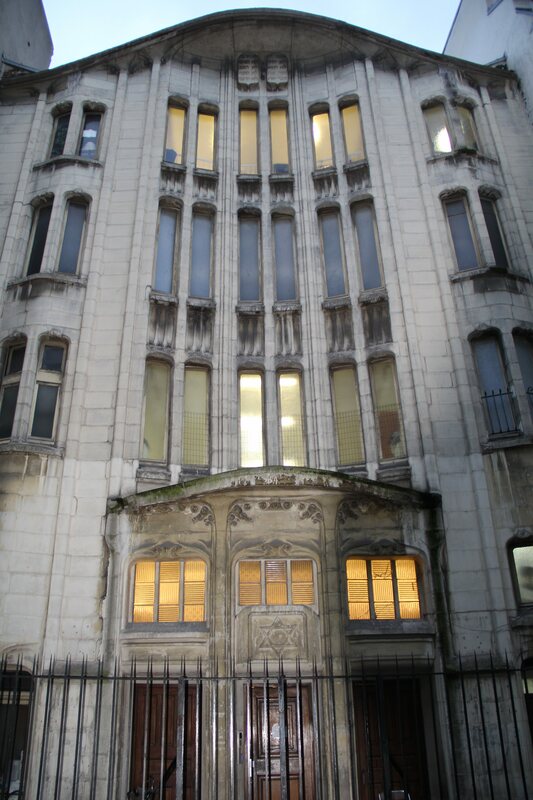 The Museum Central des Arts opened its doors on August 10, 1793. Finally, in 1882, the palace ceased to be the seat of power and was devoted almost entirely to culture. Slowly but surely, the museum began to take over the vast complex of buildings. 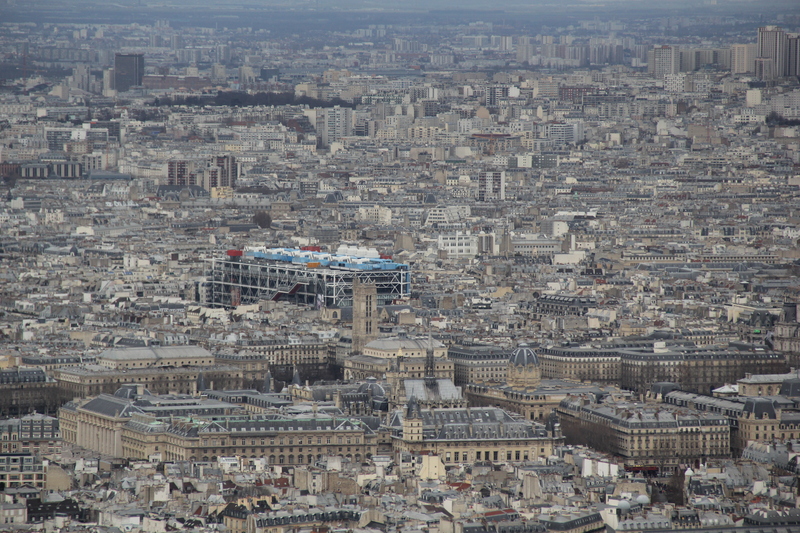 You can pick out the Pompidou Centre by how out of place the building’s blue and red colors look in the Paris skyline. 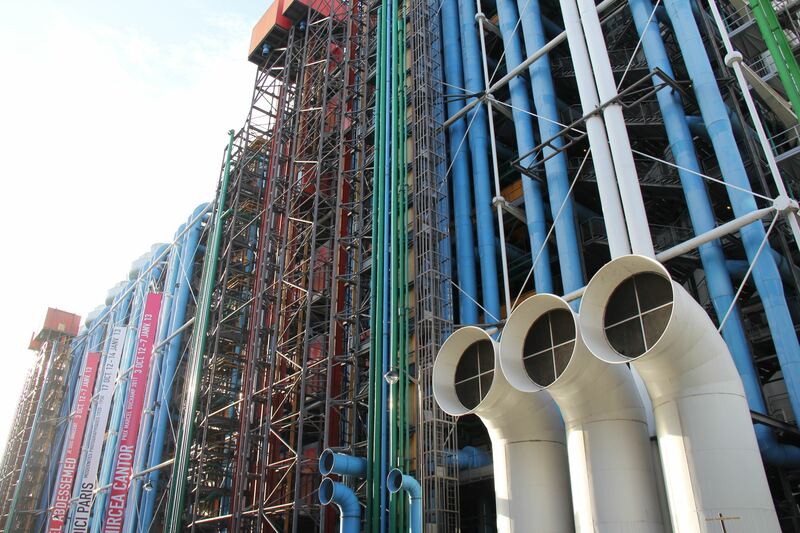 Built in 1977, the Pompidou Centre houses Paris’ modern art collection. In the spirit of modern art, the museum’s iconoclastic architecture has an inside-out feel. The top floor of the museum also hosts a stunning view of the city. 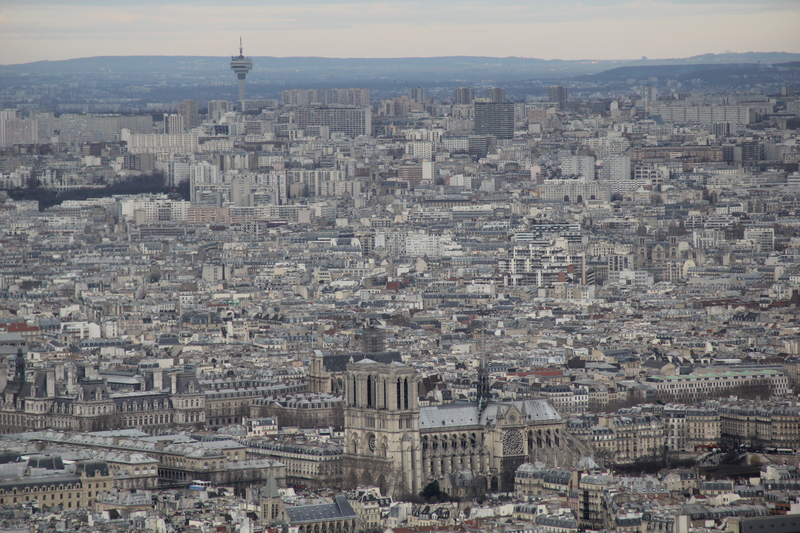 You can find the Notre Dame Cathedral by the church’s two imposing bell towers at the bottom of the photo. 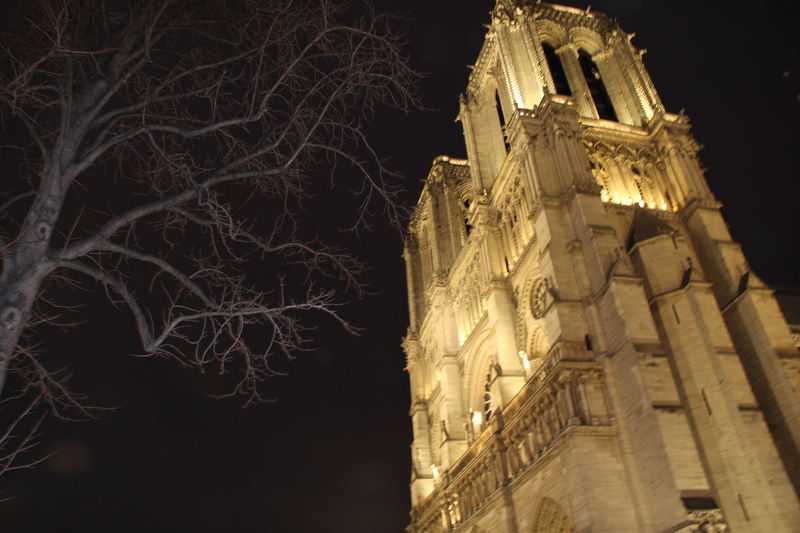 Located on the eastern half of Île de la Cité, Notre Dame is considered one of the finest examples of French Gothic architecture and among the largest and most well-known churches in the world. Construction on the church began in 1160 and was finally completed in 1345. 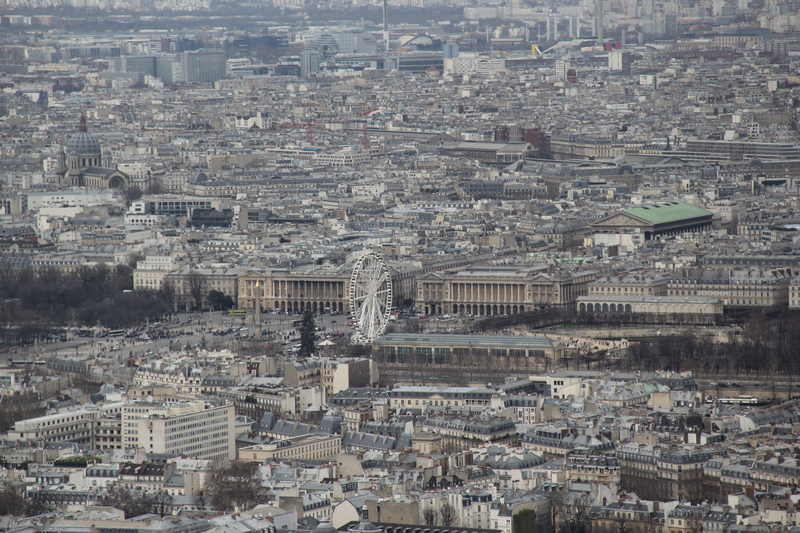 The Panthéon is the dome-topped building at the bottom of the photo. Located in Paris’ Latin Quarter, it was completed in 1790 as a church, but after many changes, now functions as a mausoleum, containing the remains of distinguished French citizens, including Jean-Jacques Rousseau, Victor Hugo, Emile Zola and Marie Curie. The Abbey of St. Germain (it’s the building with the two towers) was founded in the 6th century by the son of Clovis I, Childebert I. Over the years, it became a center of intellectual life in the French Catholic church until it was disbanded during the French Revolution. The Jardin du Luxembourg, or the Luxembourg Gardens, is the second largest public park in Paris located in the 6th arrondissement of Paris. The park is the garden of the French Senate, which is itself housed in the Luxembourg Palace. 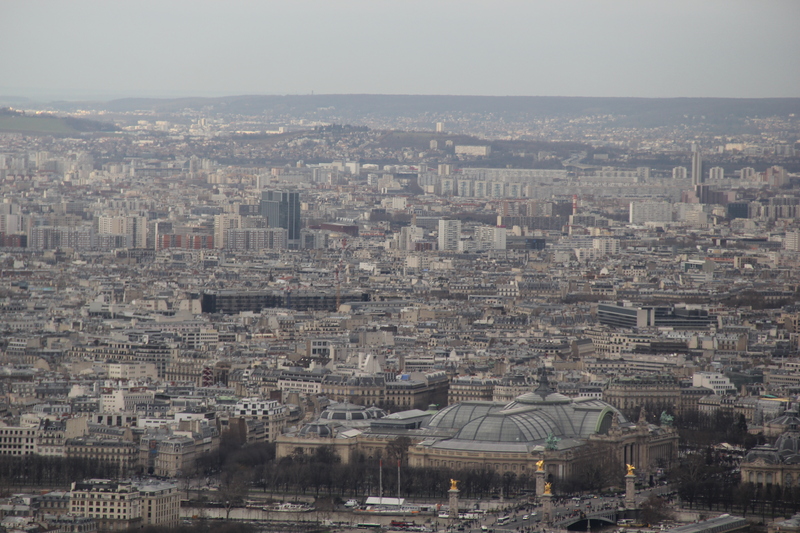 You can find the Sacré-Cœur Basilica in the distance at the top of the photo. The Basilica is a Roman Catholic church in northern Paris. 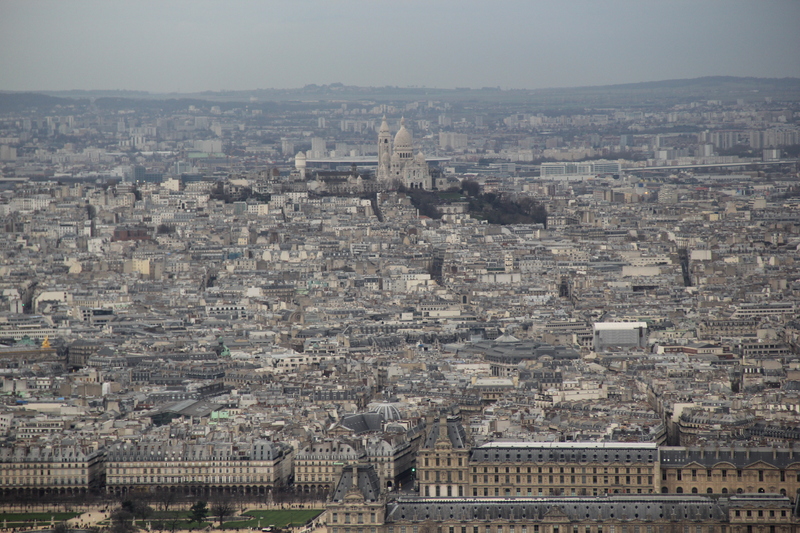 A popular landmark, the basilica is located at the summit of the hill Montmartre, the highest point in the city. Construction began in 1875 and was finished in 1914. It was consecrated after the end of World War I in 1919. Paris Montparnasse is one of the six large Paris train stations, just south of the Montparnasse Tower. It opened in 1840, and was rebuilt completely in 1969. It is used by intercity TGV trains to the west and south-west of France including Tours, Bordeaux, Rennes and Nantes, and by suburban and regional services on the Transilien Paris – Montparnasse routes. Versaille has long been a “must-do” on my Paris list, and now I can say, it has been done. And it was worth the trip. We took the commuter train from Paris to Versaille where met up with some friends from Washington D.C. The line for security was long, but fast moving. In about 10 or 15 minutes, we were inside in the palace and admiring the insane opulence of the various Louis-named French kings I can’t keep track of and wondering what it would be like to live in a house like Versaille. It would be awesome. Click to watch the slideshow. Here are three reasons – in the form of pictures – The Boyfriend is pretty amazing. 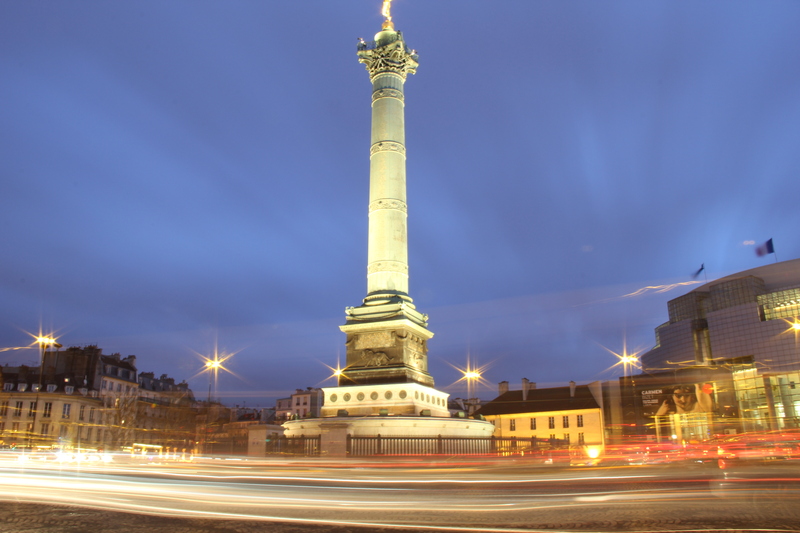 The Boyfriend patiently waited in the cold while I crouched on the sidewalk, fiddled with my travel tripod and tried to take the perfect picture of the Place de la Bastille. I think this piece of modern art is awesome, but The Boyfriend thinks it’s “stupid.” Still, he accompanied me to the Pompidou Centre and didn’t complain while I toured the entire exhibit. The Boyfriend waited in the cold for the shot of this carousal at the start of Champs Elysees as well. And it was really cold outside. 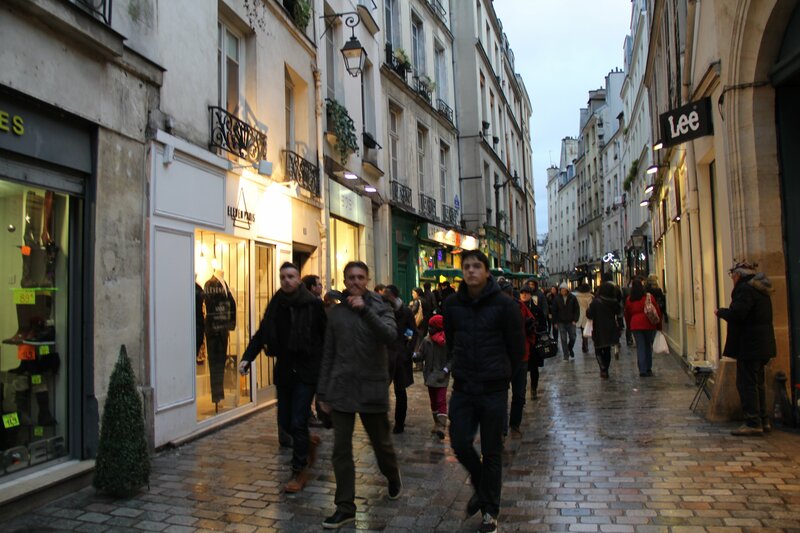 We love walking around new cities, and Paris is a great walking city. 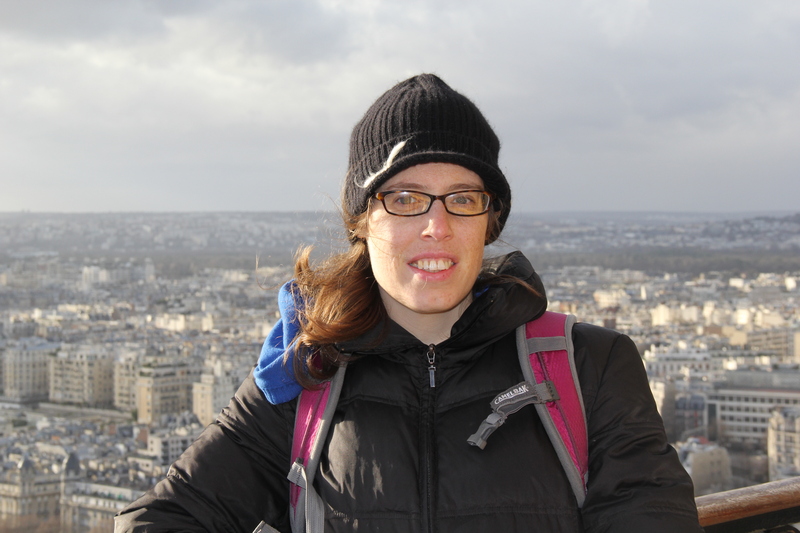 Yesterday, we put our feet to work, walking from our hotel to the Eiffel Tower, up the Eiffel Tower and down, to the Arc de Triomphe, and all the way back to our hotel along Champs Elysees. Today, our feet are killing us, but I have this awesome map to show for it. 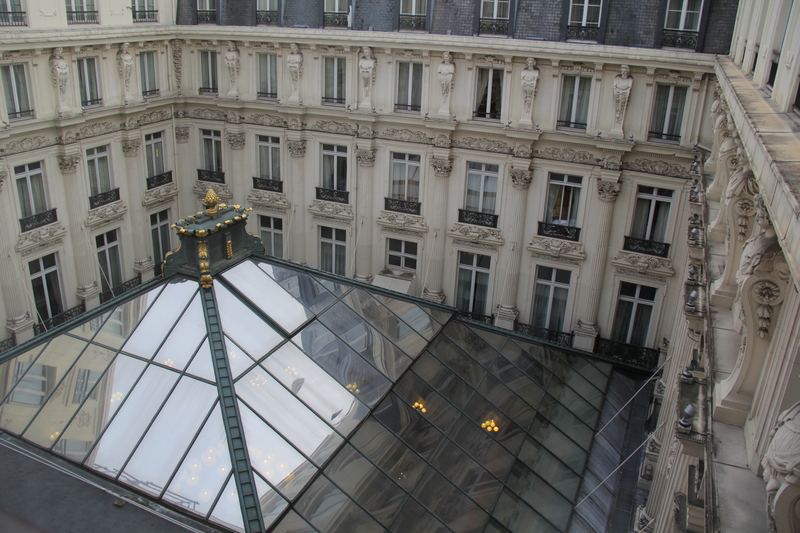 When I booked the Intercontinental Paris Le Grand with my Priority Club points, I scoured FlyerTalk and other travel blogs for reviews. 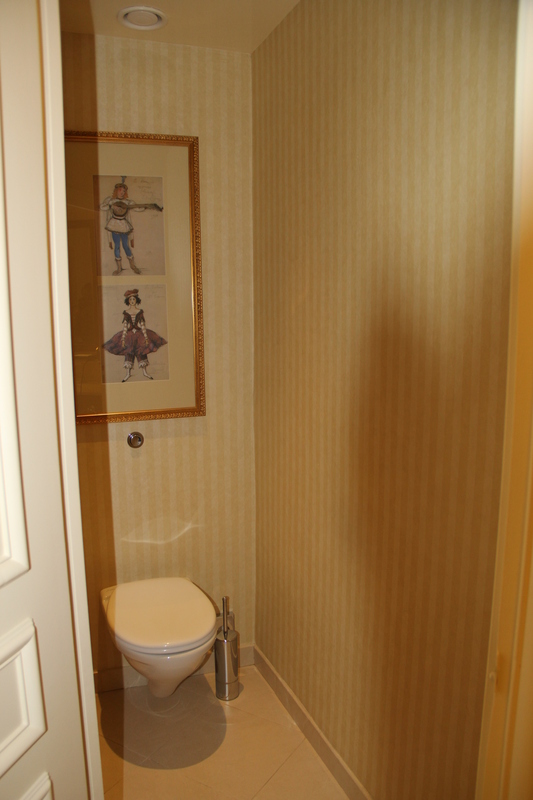 Many were uncomplimentary, focusing on the small room size and the lack of benefits for platinum Priority Club members. Despite these reviews, I booked the hotel because of its central location and the thousands of Priority Club points I’ve accumulated. So far, my experience has been great. We arrived at the Intercontinental at 10 in the morning. The woman at check-in was friendly and allowed us to check in early which was incredibly appreciated since it was 4 a.m. New York time and we were falling on our faces. When I asked if I got anything for being a platinum member, she told me she upgraded the room from a classic to a superior room and gave me free internet. This is a huge deal since Internet at the Intercontinental costs 24 euros per day. I’m somewhat skeptical of “complimentary upgrades” because a hotel will often give you an extra lamp and call it an upgrade. I prepared myself for closet-size proportions, but when I walked into the room, I was pleasantly surprised. Sure, it’s small by American standards. 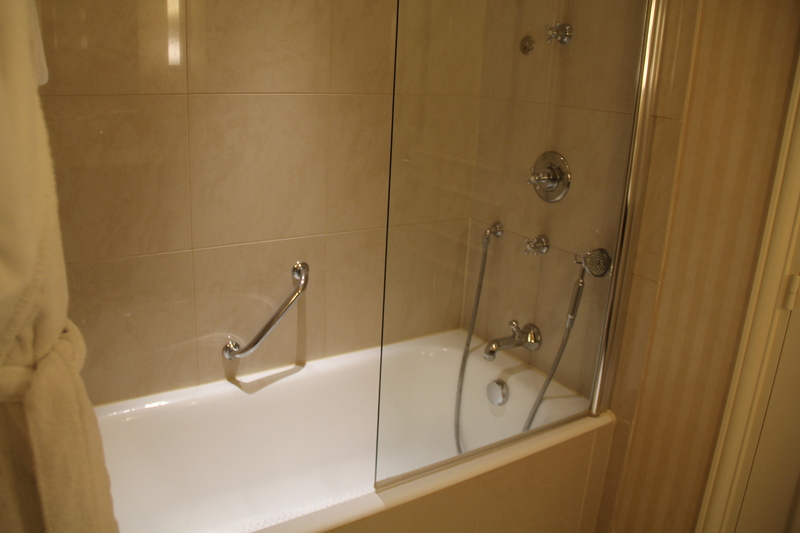 But by European standards, it’s quite nice, beautifully furnished and designed, with a decent sized bathroom (complete with complimentary robes and slippers). Hotel staff also came by later with complimentary bottles of water and a case of pastry-like items. But that doesn’t mean I don’t have exciting news to share with you. Lots of new developments in the life of Nam. For starters, I will be changing jobs in January. I try to keep the day job separate from blog life, but I’m hoping the greater flexibility of the new job will translate into a happier, less tired version of me with the ability to take more trips and see more new places. Now on to the really important stuff, i.e. Paris. The City of Lights. We leave for Paris in a week and two days and I have barely posted anything about our plans. I booked our hotel weeks ago, and I’m very excited about it. 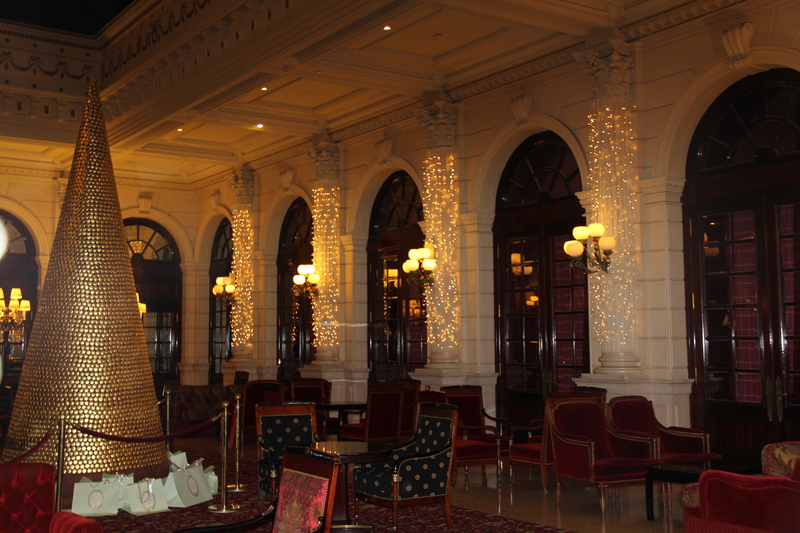 The Intercontinental Le Grand is located just north of the Place Vendom near the Opera metro stop. 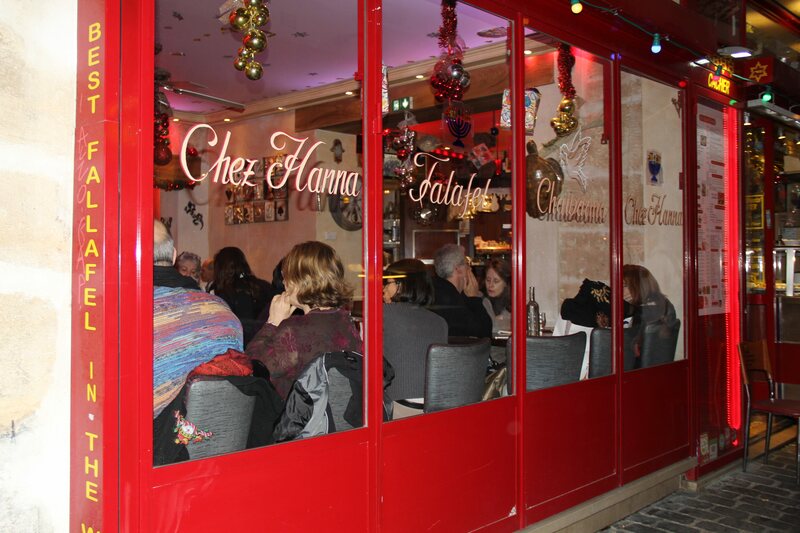 We prefer walking to public transportation so this puts in a decent location to trek to most of Paris’ main attractions. 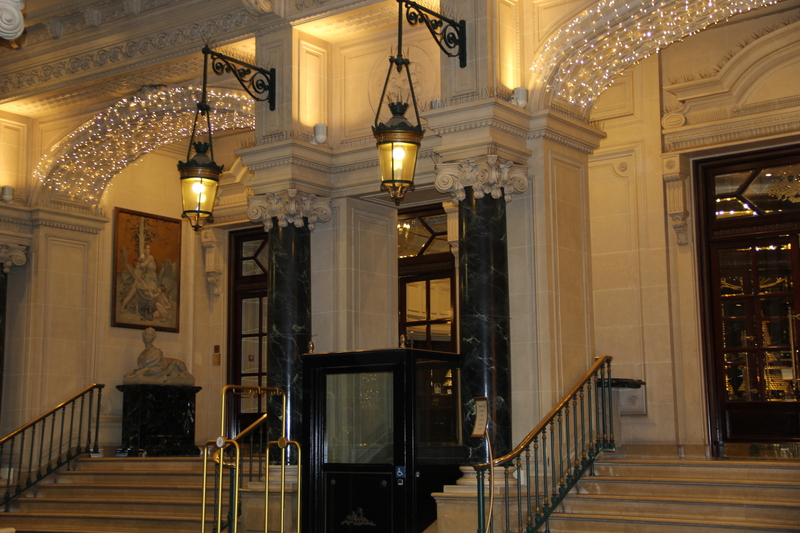 The hotel is Nice – capital ‘N’ nice. Standard rooms for the week of Christmas go for $370 to $550, but since I’m using a combination of points and free night vouchers, this wasn’t an issue. 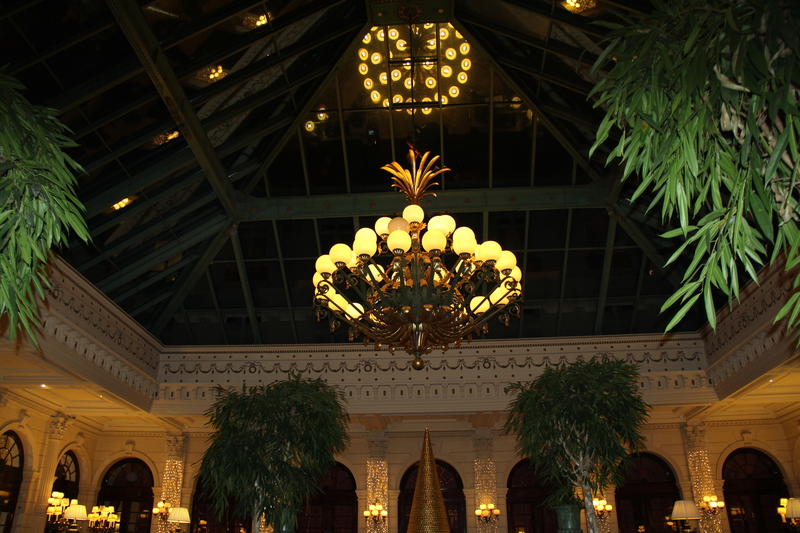 The architecture and decor is very ornate, or as some reviews describe it — very Paris. According to the reviews on Flyertalk the rooms are small, but that’s the case for most affordable (and some unaffordable) European hotels. Take a look at some of the pictures. Of course, I will post my own once I get to Paris. Oh. My. God. I’m going to Paris!